Mr. Neom Jhen struggled to support his wife and three children through farming until Samaritan’s Purse intervened. My family used to be among the poor farmers in our village. We mostly depended on growing vegetables and raising animals such as chickens, ducks, and pigs. Many of my animals got diseases because I didn’t know proper techniques to raise them. We didn’t feed them well, and I didn’t care for their shelter. Thus, chicken rearing wasn’t a successful business for my family. We didn’t have enough rice to eat, so I looked for work as a laborer in the village. My wife grew vegetables around the home to earn money to help support our family. 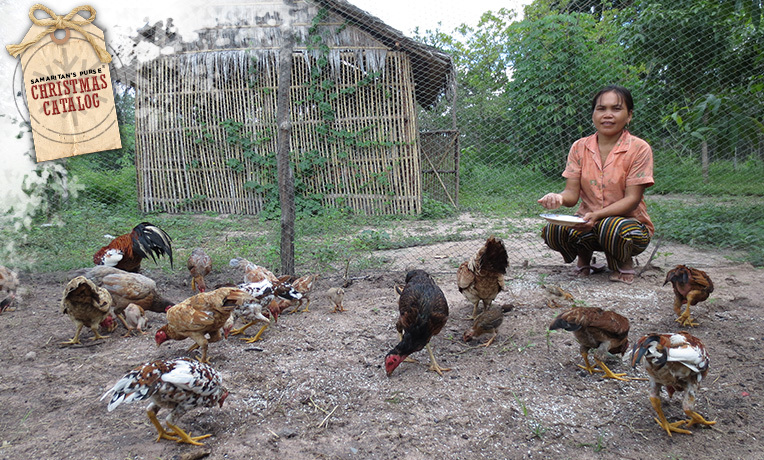 When Samaritan’s Purse selected my family as livestock and agriculture beneficiaries, we received resources such as a home for our chickens, a fishpond, and a home garden. They also provided technical training about livestock and agriculture. With my new tools and knowledge, I now make between 60,000 and 70,000 riel (14.75 to 17.25 USD) per month from selling chickens. Now, I can work at home and have enough time to take care of my children while I earn money. This has liberated my family from poverty, and now we have enough money for my children to go to school. I want to thank Samaritan’s Purse for providing me with a lot of resources and technical knowledge to make my family’s life better. I also thank them for providing motivation and encouragement for my family. We’re Christians, and we’re happy to have a Christian organization working closely with the poor people here and sharing the Good News. Families engaged in subsistence farming often live in chronic poverty and malnutrition, lacking the skills to get the most out of their small patches of land. Others have seen their livelihoods wiped out by drought, disaster, or war. Through our Animals, Agriculture, and Livelihoods programs, Samaritan's Purse has helped to provide thousands of impoverished farmers, herders, and fishermen around the world with the resources and training they need to feed their families and even obtain a modest income that can be used for education, medical care, or other needs.